Presidential candidates often work so hard equate themselves with the Founding Fathers — or Ronald Reagan. So they invent a little here, ad-lib a little there. On the most recent episode of Last Week Tonight, John Oliver set his sights on one Republican presidential candidate in particular: Ben Carson claimed in a Fox News interview earlier in October that Thomas Jefferson said, "Gun control works great for the people who are law-abiding citizens and it does nothing for the criminals, and all it does is put the people at risk." Too bad, as Oliver points out, that the term "gun control" didn't come about until the 1960s — a bit after Jefferson's time. So what to do about Carson, Mike Huckabee, Rand Paul, and others who have misquoted the men who wrote our Constitution? If you can't beat 'em, join 'em. Yep, Oliver has made a website explicitly for this purpose, called DefinitelyRealQuotes.com. "Either we care about the accuracy of quotes and where they're sourced, or we don't care at all. If quotes no longer have to be real, they should at least be fun," he said. Hence the website. DefinitelyRealQuotes.com brings you to a landing page with some of the most respectable figures of recorded history, from Gandhi to Einstein to Benjamin Franklin to Confucius. Then all you do is click "Deliver Me Some Wisdom!" and you get a "definitely real historical quote." The website randomly pairs ridiculous quotes with historical figures. So maybe Gandhi did say "They're real and they're spectacular." Or maybe it was Marie Curie. Either way, they sound like a more authoritative source than Teri Hatcher's character from her guest appearance on Seinfeld. 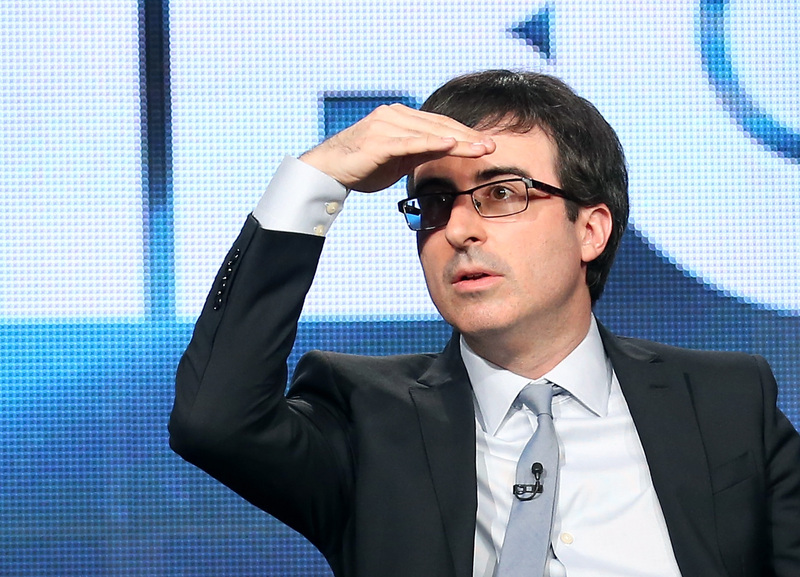 The Last Week Tonight team shared a tweet with a quote "from" Karl Marx and fans of the show quickly jumped on the bandwagon, tweeting and retweeting with more funny combinations. As Oliver points out in the broadcast, if presidents and presidential candidates can make up quotes, then why not us? In the end, does it matter who said, "Britney, will you accept this rose?" As long as you respect the important role of reality TV in our society, it could have been Alex, Bob, or Byron. It could even have been Justin Timberlake back in his days with Ms. Spears. Who knows? For the record, it's "definitely" Karl Marx. In a nod to inclusion, there are two women featured. If you ever wondered what Marie Curie was thinking about fish, or Amelia Earhart's food safety standards, then there's a quote for you. There's nothing more inspiring. When considering which one to share on Facebook, maybe you should listen to Oliver and have a backup. Thank you, John, for another fake history lesson. Check out the segment below.